Peptide (C)RDAIVKVKEVHDE, corresponding to amino acid residues 183-195 of rat Gephyrin (Accession Q03555). Intracellular. 1,2. Anti-Gephyrin Antibody (#AIP-005), (1:200). 3,4. Anti-Gephyrin Antibody, preincubated with the control peptide antigen. Immunohistochemical staining of rat hippocampal dentate gyrus sections using Anti-Gephyrin Antibody (#AIP-005). 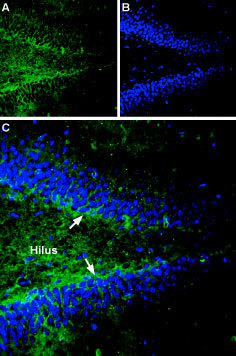 A. Gephyrin staining (green) appears in hilus of the dentate gyrus (arrows). B. Nuclear staining using DAPI as the counterstain (blue). C. Merge image of panel A and B.
Chen, J. et al. (2014) Front. Cell. Neurosci. 8, 276. Tyagarajan, S.K. and Fritschy, J.M. (2010) J. Physiol. 588, 101. Maric, H.M. et al. (2014) ACS Chem. Biol. 9, 2554. Fritschy, J.M. et al. (2008) Trends Neurosci. 31, 257. Zacchi, P. et al. (2014) Front. Cell. Neurosci. 8, 103. Lorenzo, L.E. et al. (2014) J. Neurosci. 34, 8300. Gephyrin is a highly conserved, intracellular scaffolding protein responsible for the post-synaptic anchoring and assembly of the inhibitory glycine and γ-aminobutyric acid type A receptors (GlyR and GABAAR); it essentially anchors the receptors, by auto-oligomerization, to the cytoskeleton1,2. GABAergic transmission is important for the mediation of neuronal excitability and has a crucial role in neurodevelopment, throughout the central and peripheral nervous systems (especially via GABAAR). Glycinergic neurons on the other hand control motor functions and sensory signaling as well as take part in pain transmission in the spine's dorsal horn. Importantly, gephyrin has a 1:1 stoichiometry with GlyR3,4. Up-to-date atomic force microscopy data of gephyrin has shown that it forms trimers with multiple conformations. It is a modular construct with three domains: an N-terminal G-, a central C- and a C-terminal E-domain. Recent work suggests also that gephyrin regulates neuronal differentiation by anchoring small cytoskeletal-related signaling molecules at unique subcellular locations2,5,6. Immuno-colocalization of Vesicular GABA Transporter and Gephyrin in rat spinal cord.Immunohistochemical staining of perfusion-fixed frozen rat spinal cord sections using Anti-Gephyrin Antibody (#AIP-005), (1:300) and Anti-Vesicular GABA Transporter (VGAT)-ATTO-594 Antibody (#AGT-005-AR), (1:80). A. Gephyrin staining (green) appears in the superficial layer of the spinal dorsal horn and some cellular profiles were stained. B. VGAT staining (red) appears in superficial layer and in cell profiles. 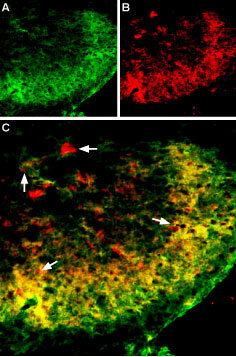 C. Merge images of A and B reveals co-localization (arrows) in superficial layers and separate expression in some cells. Cell nuclei were stained with DAPI (blue) as the counterstain. Alomone Labs is pleased to offer a highly specific antibody directed against an epitope of rat Gephyrin. Anti-Gephyrin Antibody (#AIP-005) can be used in western blot and immunohistochemistry applications. It has been designed to recognize GPHN from rat, mouse, and human samples.